Electronic Kit School. - There are many electronic device using display to indicate some activity or quantity when work. It is look like when we go to the trafict light, we will find that there is seven segment display to show up to down timer for waiting. It also make many electronic circuit to result display with many device like LCD, 7 segment, dot matric and other. In here we will show you limit display for static 0 to 9 diplay using 7 segment driven by two TTL ICs like 7490 and 7446 look like in Figure 1 below. Circuit like in Figure 1 above show you about the Static Zero to Nine Display Circuit using 7490 and 7446 ICs. From Circuitstoday site describe that the circuit above is one of the simple 0 to 9 display that can be employed in many applications. The circuit is based on asynchronous decade counter 7490, a segmen segment display (D1), and a seven segment decoder/driver IC 7446. The usual seven segment display consists of 7 LEDs labelled ‘a’ through ‘g’. By forward biasing different LEDs, which can display the digits zero through nine. Seven segment displays are of two types, common cathode and common anode. In common anode type anodes of all the seven LEDs are tied together, while in common cathode type all cathodes are tied together. The seven segment display used here is a common anode type .Resistor R1 to R7 are current limiting resistors. 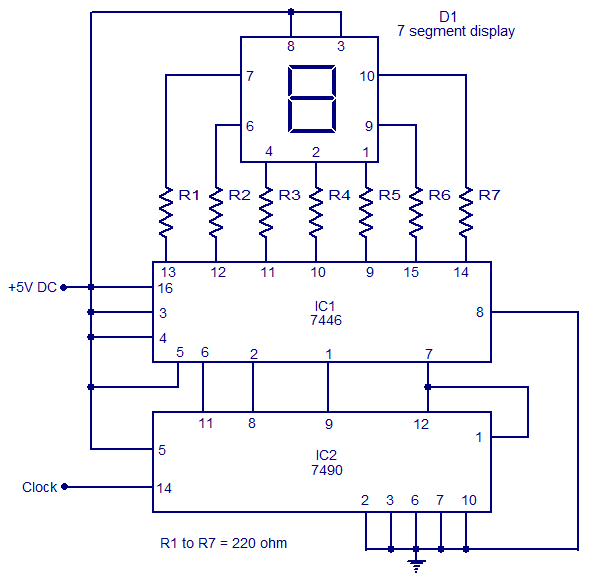 IC 7446 is a decoder/driver IC used to drive the seven segment display. Working of this circuit is very simple. For every clock pulse the BCD output of the IC2 (7490) will advance by one bit. The IC1 (7446) will decode this BCD output to corresponding the seven segment form and will drive the display to indicate the corresponding digit.